Morocco is a rich mix of Berber, Arab and French culture. A land as much defined by its geographic as by its people. Morocco is bordered in the east by the vast and desolate Sahara desert. On the west is the Mediterranean and in the north and center are a series of rugged mountain ranges. Whether an outdoor enthusiast, a foodie, passionate about photography, interested in meeting the locals or excited to learn about a place through its history — Morocco has something for every traveler. Roughly the size of California, Morocco is a large country to explore. 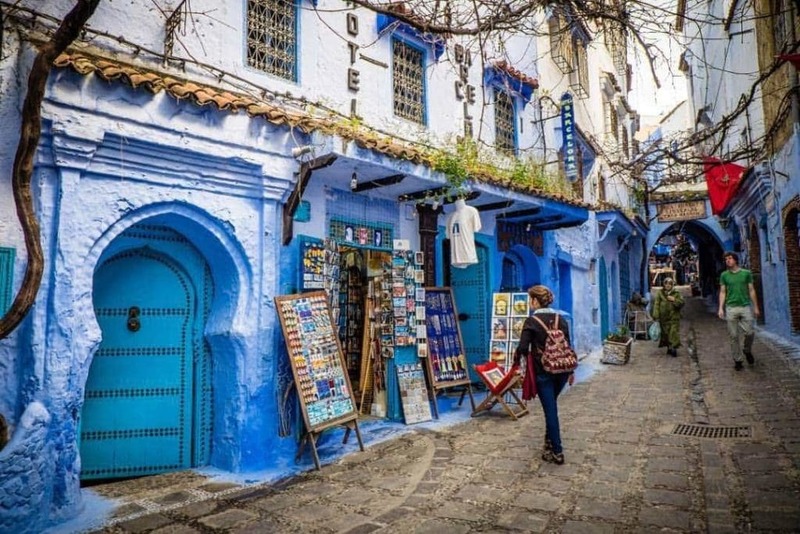 With 10 full days in Morocco travelers can see many of Morocco’s highlights while also having enough time to get off the beaten path, meet locals and go beyond just checking off famous sites. Below is our recommendation for the best 10 day itinerary to Morocco. Interested in experiencing a similar trip? 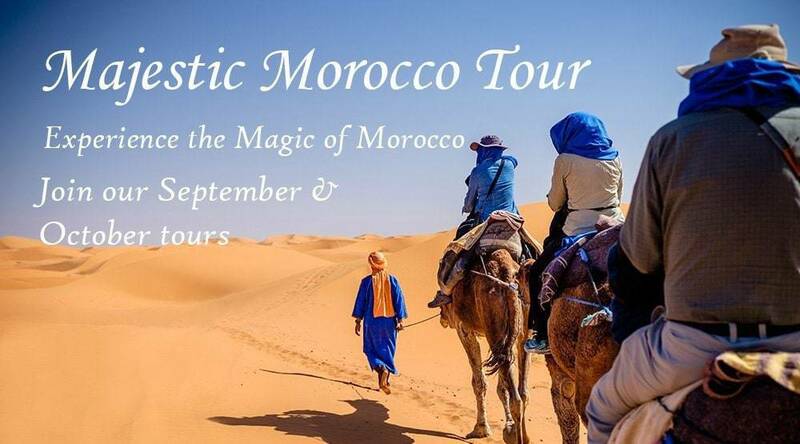 Join one of our upcoming Majestic Morocco tours and you’ll enjoy the very best Morocco has to offer, while experiencing the highlights recommended in this article. Arrive in Marrakech and spend 2 days exploring this vibrant cultural center. 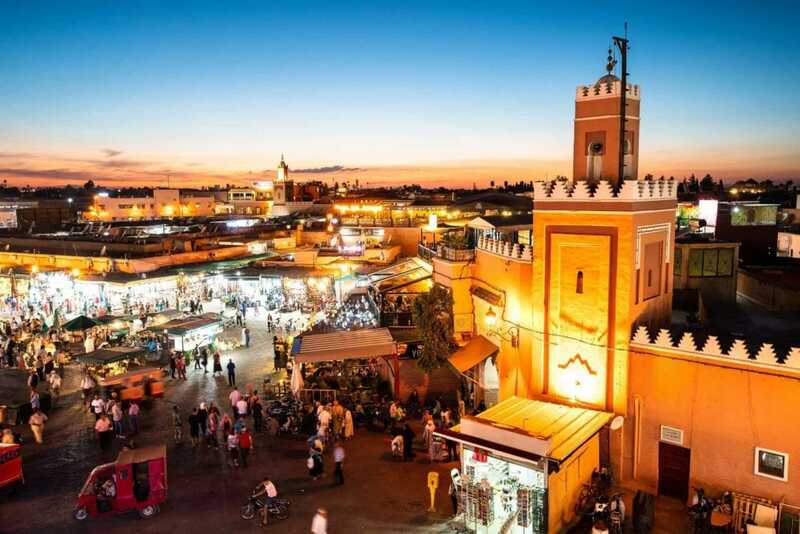 Begin your time in Marrakech with a walking tour of the Red City’s famous medina. Explore Marrakech’s historic medina. Discover family-run shops that have been run by the same family for generations. Get lost in the twisting medieval laneways of the medina. Sip mint tea and watch the sunset at the Djemaa el-Fna. Termed the Red City for the red build materials used to construct the historic center, Marrakech is the located at the foothills of the Atlas Mountains. One of Morocco’s 4 Imperial Cities, it was built by Berber chieftains in 1062 AD. Sunset over Marrakech's famous Djemaa el Fna square. Photo by Genevieve Hathaway. Meeting the keeper of the hammam's harth. 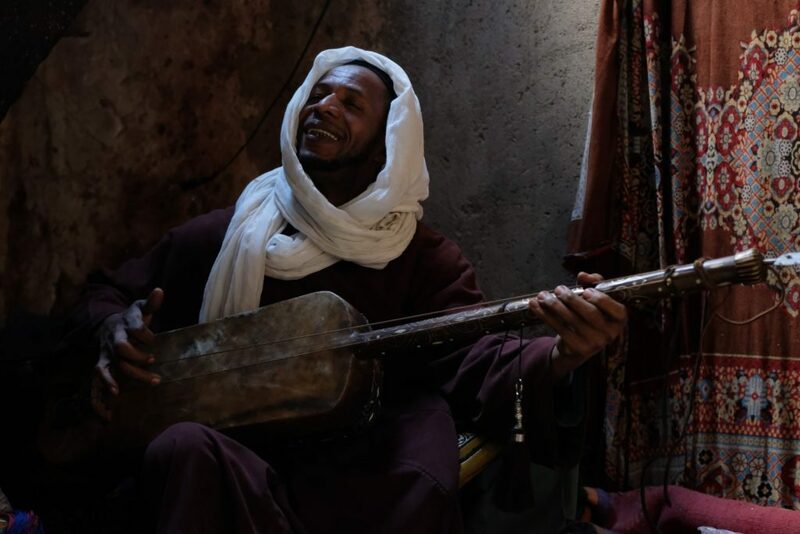 He tended the fires that heated the water in the hammams and in his down time played this traditional Moroccan instrument. Marrakech is full of these small cultural moments. Photo by Genevieve Hathaway. On your second day in Marrakech visit many of the city’s historic sites. Explore the maze of colorful souqs, see the impressive Koutoubia Mosque with its imposing minaret, learn about Morocco’s history of education and scholars at the Ali ben Youssef Medersa, and enjoy the opulence of the stunning Bahia Palace. Experience the excitement and energy of the street performers at Marrakech’s Djemaa el Fna square – including Morocco’s legendary storytellers. Practice your bargaining skills shopping for lovely gifts to take home with you, or relax in one of Marrakech’s many luxurious hammams (spa). 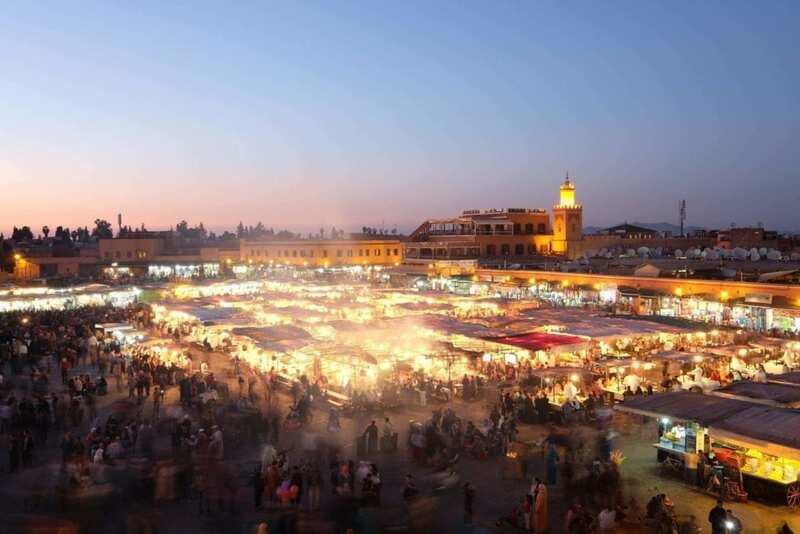 In the evening, learn about Moroccan culture and food on a fun and immersive food tour of Marrakech. Explore Marrakech at night and dine on classic Moroccan food at local eateries while learning about local customs, tradition and history. Begin the day driving across the High Atlas Mountains enroute to the famous Sahara desert. Termed the ‘Mountains of Mountains’ by Moroccan Berbers, the High Atlas mountains are the tallest mountain range in North Africa. A series of jagged, impressive peaks that split the country east to west; travel through this impressive scenery to the high plains around Skoura and Ouazazate. Explore many of the hidden historic kasbah, tucked into small mountain hamlets. Kasbah were fortified small towns that the tradesmen and caravans were stop at on their journey from Africa to the coast to trade their goods. Stay at one of the local guesthouses and enjoy traditional homecooked Berber-style meal. 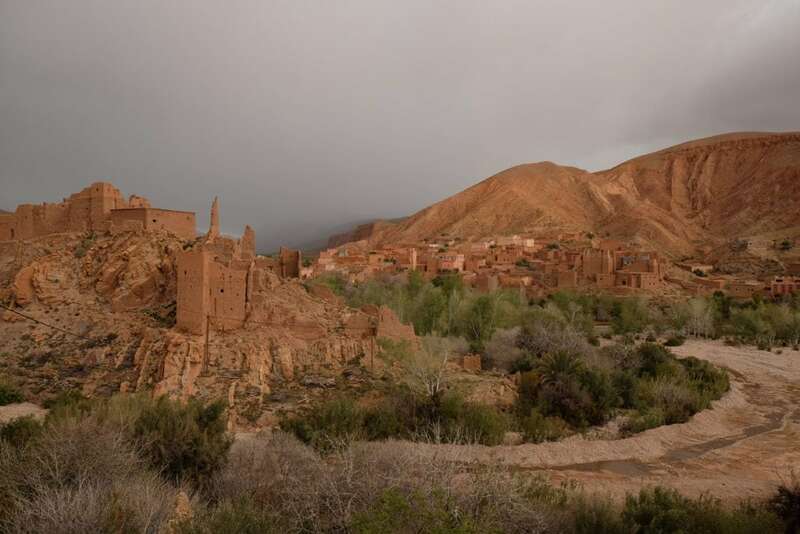 In the morning, visit the stunning, excellently preserved Almoravid kasbah of Ait Benhaddou. 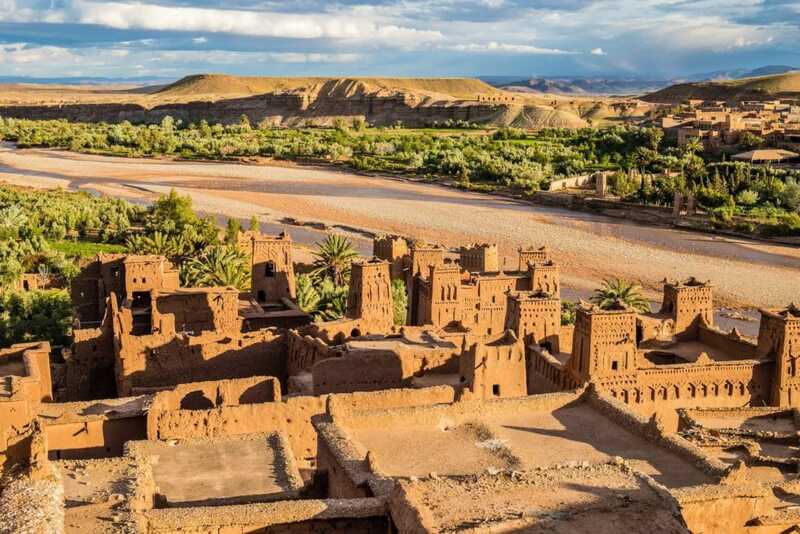 Considered the best preserved ancient kasbah in Morocco, this still inhabited fortified village provides a unique look at life inside these crucial outposts along key trade routes. From Ait Ben Haddou, pass through Skoura surrounded by an arid desert plateau. . Located on a key trade route, with blue-robed Tuareg desert traders bringing through caravans of gold and spices in ancient times, Skoura is now famous for its ancient kasbahs and forests of palm groves. This 2 day roadtrip ends at the massive Erg Chebbi dunes, where the rocky western desert meets the sand of the Sahara. Crumbling ancient kasbahs driving through the rugged High Atlas. Photo by Genevieve Hathaway. Located on the Morocco-Algerian border, the Erg Chebb dunes are an impressive stretch of the Sahara desert. 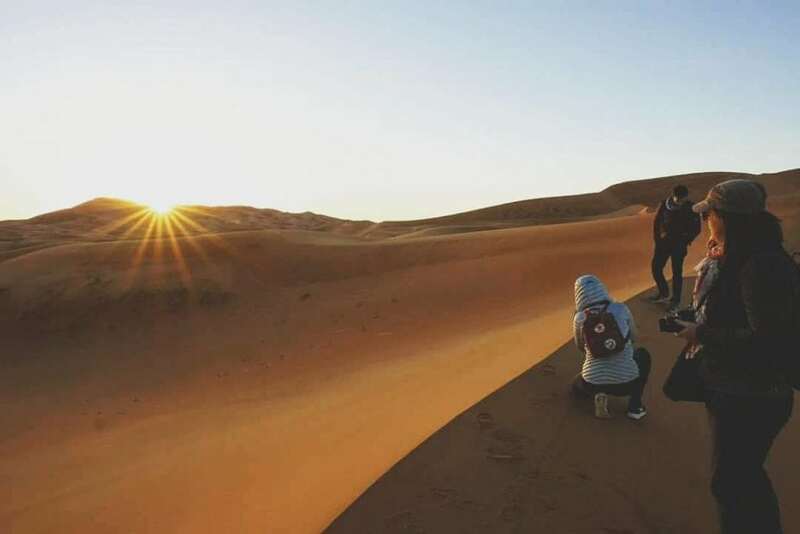 Enjoy a magnificent sunrise over the dunes – a warm orange glow cast over the endless curving golden desert of the Sahara stretched out as far as the eye can see. 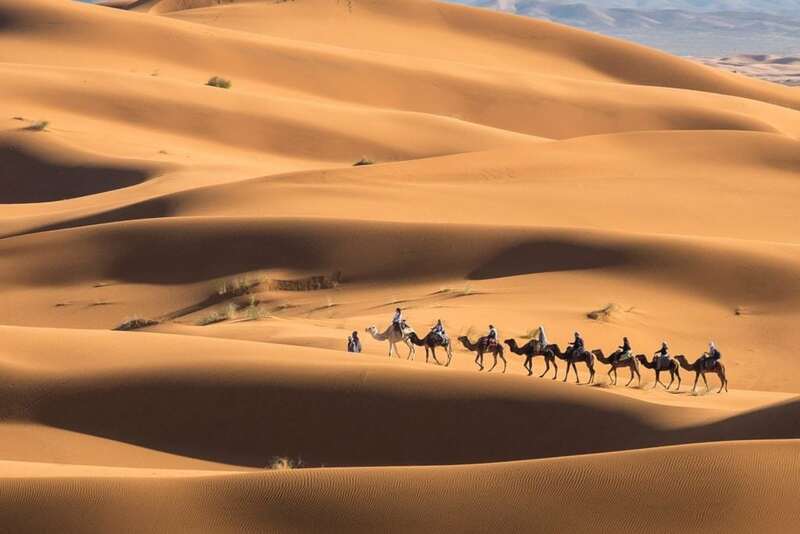 Take a mid-day camel trek and overnight in the Sahara dunes. Camels have been the primary mode of transport in the desert for a millennium. In the afternoon, explore the surrounding dunes. Without much light pollution, the skies in the Sahara are a swarth of stars. See if you can spot the southern constellations. It is also a great opportunity for nighttime photography enthusiasts. For those who are interested, try your hand at star photography and long night exposures. Capturing the morning sunrise over the dunes. Photo by Genevieve Hathaway. Wake at dawn to watch the sunrise over the Sahara, then trek with the camels back to the duneline. It’s off to Fez! Enjoy dramatic views and vistas as you drive through the High Atlas and Middle Atlas mountain ranges traveling from the Sahara Desert to the ancient city of Fez. Along the way stop in the Middle Atlas to spot the endangered Barbary macaque monkeys. Arriving at Fez in the late afternoon, enjoy classic Fesi dishes – Fez is considered one of the culinary capitals of Morocco! 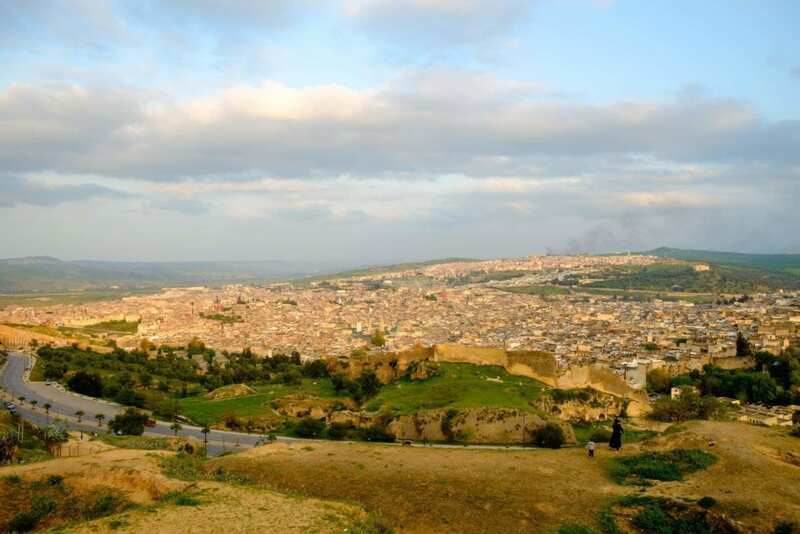 Fez, Morocco’s Yellow city, is one of the oldest cities in world. Explore Fez’s ancient medina, getting lost in the maze of small laneways many of which date back 1200 years. Learn how Morocco’s crafts are made on a walking tour of Fez. Listen to the melodious Call to Prayer echo off the ancient minarets and thick medina walls, while sipping Berber mint tea from one of the many café terraces overlooking the old city. 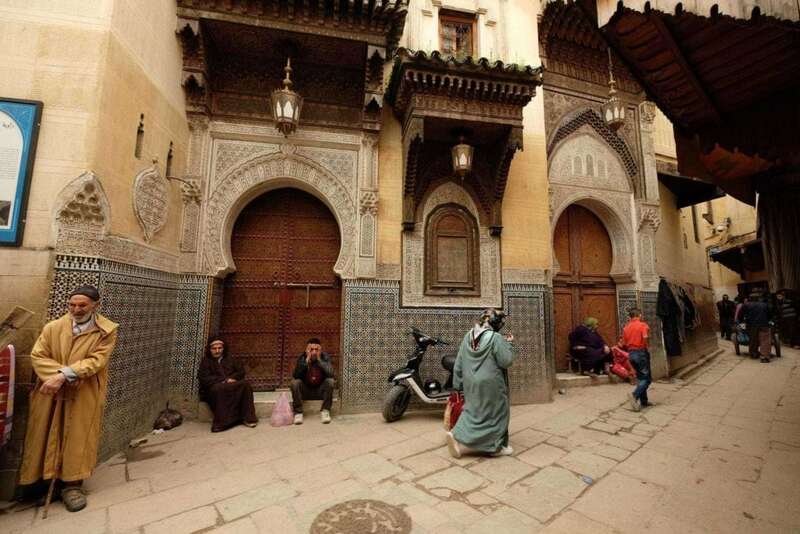 Shop for local crafts, photograph the ancient city, or relax in one of Fez’ many excellent hammams. Sunset over Fez's ancient medina. Photo by Genevieve Hathaway. Daily life on the streets of historic Fez. Photo by Genevieve Hathaway. Drive from Fez to the Rif Mountains and the quaint village of Chefchaouen. Located in a nook of the Rif Mountains, the tiny mountain town of Chefchaouen is Morocco’s Blue City. Bargain for Bedouin-made jewelry, spices and ceramics amongst the bluewashed buildings of Chefchaouen’s medina. Enjoy sweet and savory chicken or vegetable pastilles, a famous local dish. Watch the sunset from the Spanish Mosque, high over Chefchaouen. The twinkling lights of the village illuminating the pastel blue buildings. Chefchaouen, with its picturesque pastel blue medina and quaint little mountain town, is a wonderful place to linger. And linger you can. 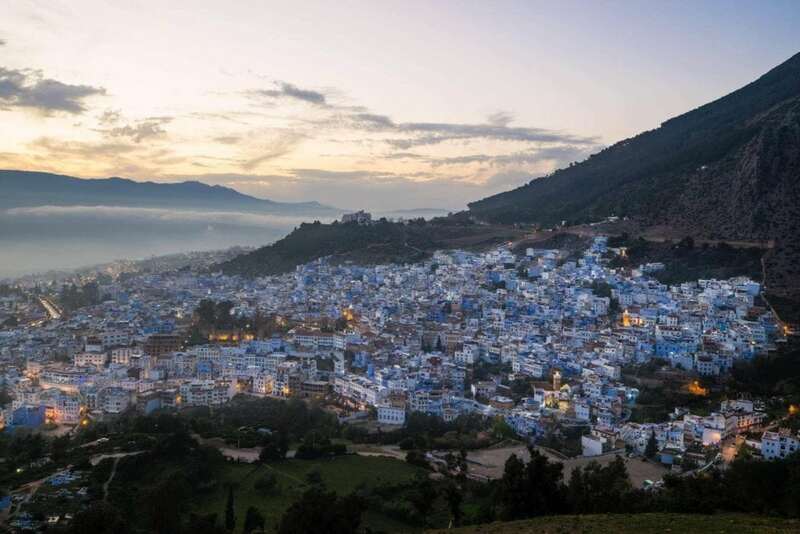 Explore this Moroccan-Andalusian town – poke your head into the high-quality boutique shops, relax at a hammam (spa), take a hike through the surrounding mountains or just enjoy the stunning view from one of the many hillside cafes. Sunset over Chefchaouen, the Blue City. Photo by Genevieve Hathaway. Exploring the pastel blue laneways of this magic town. Photo by Genevieve Hathaway. Wrap up your time in Morocco with Casablanca, the White City. Enjoy Casablanca’s cosmopolitan core, shops, wide French-inspired boulevards and waterfront promenade. 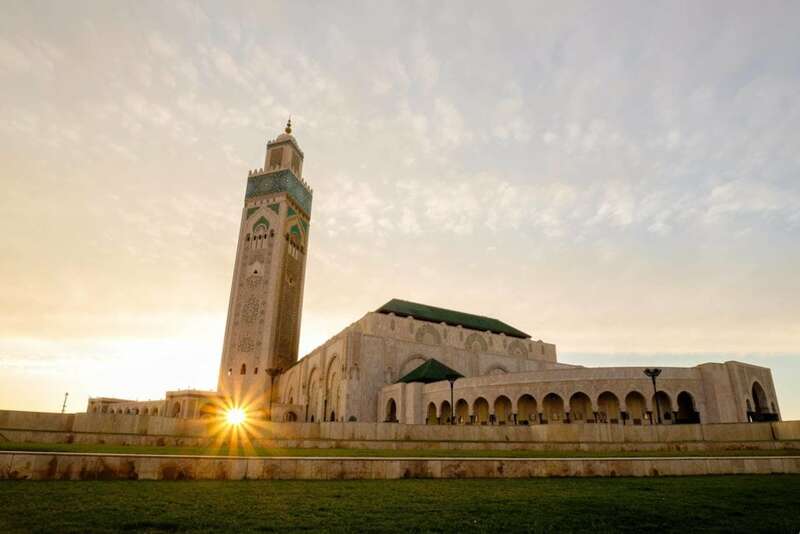 Marvel at the modern architectural wonder of the colossal Hassan II mosque with the tallest minaret in the world. After an amazing time in Morocco, it is time to depart for home with a suitcase full of memories…and maybe a few mementos. Sunset at the Hassan II mosque. Photo by Genevieve Hathaway. Interested in your own 10 day Morocco adventure? We have you covered! Join an upcoming one of our upcoming Majestic Morocco Tours and experience the very best Morocco has to offer!